If we were in the BBQ business instead of the coffee business, we would never try to sell Kentucky ribs to someone looking for Texas brisket. Just because both come from Southern states known for an obsession for smoked meat doesn’t mean they’re automatically interchangeable—a fact we generally know to be true in coffee, especially when comparing, say, Colombians and Brazils, or Kenyans with Ethiopians. Though there certainly are coffee-growing regions with tighter-knit profiles and like climates, Asia Pacific is not one of those regions, even though the islands are often lumped together under the same broad category—occasionally even tied to a much broader “Asian” spectrum that includes India, Thailand, and Vietnam. That, friends, is like trying to swap vinegar for mustard and hoping nobody will notice. “We used to sell PNGs as Sumatra replacements!” laughs Piero Cristiani, Cafe Imports’ senior green-coffee buyer, poking a little fun at himself—and, quite honestly, many of us in coffee who have made the same blunder. Papua New Guinea (PNG) is one of the four or five main coffee-growing “names” in the Asian-Pacific Ocean, along with East Timor, and the Indonesian islands of Java, Sulawesi, Sumatra. While they’re all quote-unquote “close together” in a cluster of archipelagos, the climates, cultures, and, of course, the coffees from these places are vastly different from one another—we’re talking a whole different cut of hog. Piero laughs and shakes his head because he’s been making the long trip from his El Salvadoran home base to the far reaches of the Pacific for the past five years, visiting producers, cupping coffees, and tempting fate on the backs of mopeds throughout the different islands and island nations. This year, he took along Andy Reiland, Cafe Imports’ creative director and resident photojournalist, to record and report back on the myriad flavors and features in that part of the world. Andy’s photos tell the story—stories, really—of these incredible, dynamic places. Once you see them, and once you taste these coffees, you’ll never lump them together again. There is a whole world of flavor and culture in the Asian Pacific Ocean, and the coffees from there can stand on their own: Each profile distinct and each producer unique, defying the conventional tendency to categorize them all together. If you like the spicy snap of a vinegar-based BBQ, maybe the brightness of a Sulawesi coffee is your thing; if you tend toward the smokier, muskier flavors, Sumatra’s where it’s at. 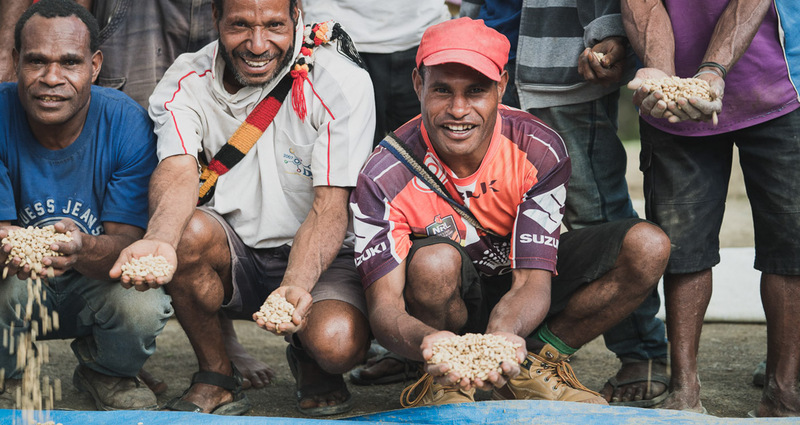 Complexity—savory fruit and structured sweetness—is Papua New Guinea’s style. No matter what your ‘cue, however, remember that they’re not remotely all the same brew. We’ll see the following coffees from Papua New Guinea, Sulawesi, and Sumatra in the coming weeks, and we can’t wait to bring you along on an exploration of the vibrant and dynamic cups they have to offer, direct to you from our producing partners there. Sweet and clean with a smooth mouthfeel; caramel, chocolate, apple and lemon flavors with a savory tropical aftertaste. Balanced, sweet and savory with tangy acidity and a heavy mouthfeel; sugar cane juice flavor with toffee, lime and some floral. Syrupy sweet with tangy fruit acidity and a smooth mouthfeel; lots of caramel and baked apple with lime, melon and chamomile flavors. Rich dark chocolate and toffee with squash blossom, stone fruit and cooked carrot flavors; sweet with lemon acidity and a smooth mouthfeel. Sugary sweet and very tangy acidity with a creamy mouthfeel; lots of juicy fruit flavor with chocolate, floral, orange and tamarind. Sweet with tart and tangy citric acidity and a heavy mouthfeel; lots of roasted red pepper and grapefruit with chocolate and fresh clean earthy flavors. Sugary sweet with tart and tangy acidity and a creamy mouthfeel; lots of brown sugar and vanilla flavor with grapefruit, sage and lemon- lime.